Gluten Free Flour Mix [Whole Grain Buckwheat (25%), Rice Flour, Maize Flour, Quinoa Flour (2%)], Pepitas (15%), Resistant Dextrin (Prebiotic Fibre), Chickpea Hulls, Psyllium Husk, Golden Syrup, Emulsifier (Sunflower Lecithin), Salt. Meet the ultimate in good food karma. With fibre and prebiotics infused into crunchy flakes of buckwheat and quinoa, plus a sprinkling of pepitas, our Active Balance range is designed to keep your tummy’s good bacteria happy and your digestive system in check. And the added bonus? Active Balance is low in sugar and free from artificial colours and flavours. Try it in Multigrain & Cranberry, too. *Monash University Low FODMAP Certified™ product: FODMAPs are a group of dietary sugars that are indigestible or poorly absorbed by the gastrointestinal tract. 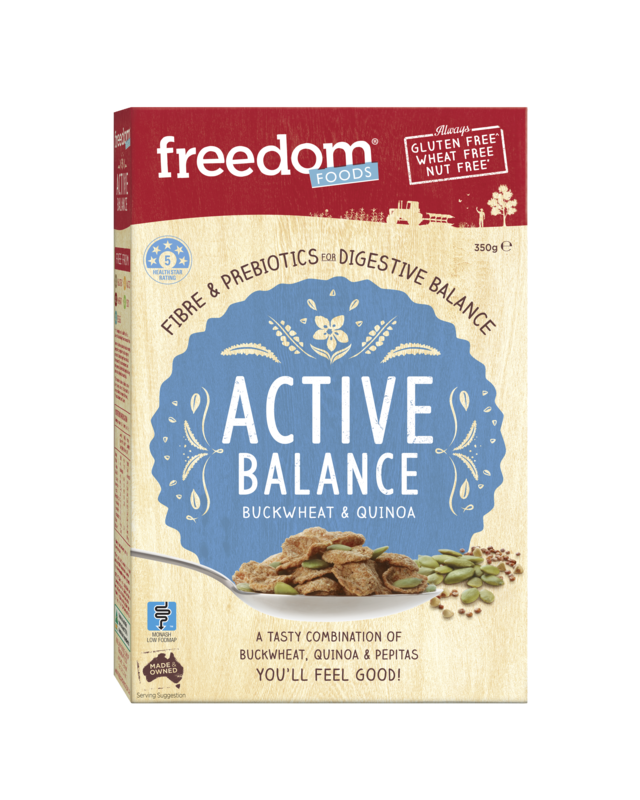 Samples of Active Balance Buckwheat & Quinoa have been analysed and were assessed to be low in FODMAPs. being a coeliac for all of my 62 years and during my adult years finding that good breakfast cereal has been a nightmare most of them were utter rubbish,tasteless, costly and no health benefits whatsoever. But now I’ve been having Freedoms buckwheat and quinoa for a number of years now I top it up with fresh berries and fruits and it keeps me going for a good portion of the day and I know it aides me in my gut health plus when its on special at the supermarkets I load up big time.. Thanks Freedom Foods you’ve been a breakfast time lifesaver. Great for those on low FODMAP diets. And tastes great too. Congratulations on a wonderful cereal ! I was so overwhelmed by the cereal market avoiding most well known brand cereals due to their high sugar content. Oats and weetbix can get boring after a while. Your product is fantastic and ticks all my boxes. I found your product in the supermarket health section and thought to give it a try….after visiting your website I see there is a lot more on offer so I will be trialing a few more goodies as well. Keep up the good work. 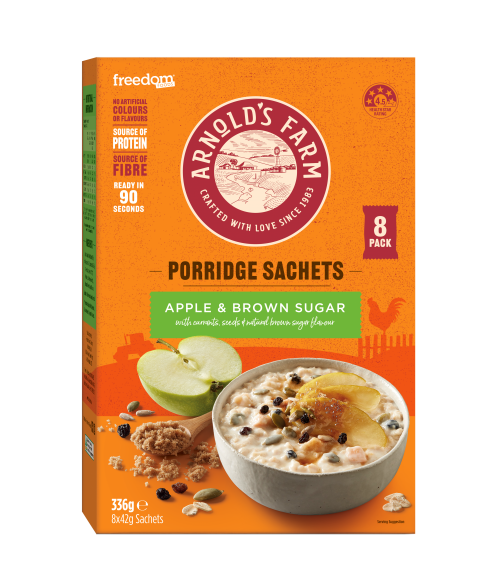 I’ve been eating this cereal for a few years and love it with natural yoghurt, grated apple, sunflower seeds and fresh raspberries or blueberries. Crunchy and low-sugar which is so important for the day’s most important meal. Lasts me for many hours. Please supply in bigger size and consider more low-sugar (even no added sugar) cereal mixes. Delicious, it is so hard to find cereal that isn’t loaded with sugar. It would be great if it was a little cheaper and I could buy it in bulk. amazing product, probably the only cereal i could find that doesn’t have heaps of sugar! the problem now is the rest of my family have also caught on and the 2 boxes i buy barely last more than a couple of days. 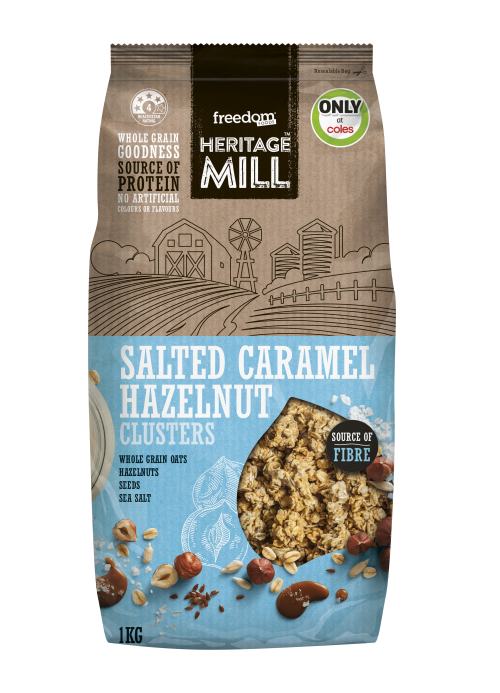 I tend to avoid packaged cereals but this stuff is amazing. It’s GF and low sugar which attracted me to it in the first place but it’s really tasty too. The pepitas really add to the flavour – love it! Love it!! taste great, nice crunch and TONNES of fibre for your gut. the best I’ve ever tasted !! It is great to find a gf cereal that’s not loaded with sugar and really yum too. Add some goji berries for extra superfood goodness. I love these. So do my kids. So healthy and tummy friendly. I wish I could buy them in bulk because it only lasts a couple of days! I picked up three boxes as the Gluten Free Expo in Auckland and wish I had picked up at least three more – super delicious! 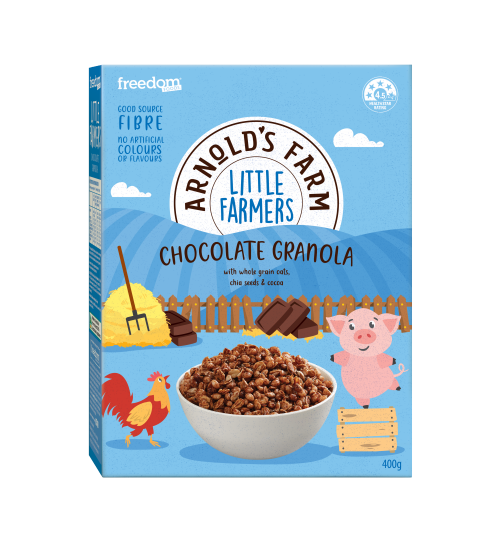 This is the first Freedom Foods cereal that I’ve eaten and I loved it! It’s delicious and healthy!